We present the gravitational microlensing discovery of a 4 MUranus planet that orbits a 0.7 MSun star at 18 AU. This is the first known analog of Uranus. Similar planets, i.e., cold ice-giants, are inaccessible to either radial velocity or transit methods because of the long orbital periods, while low reflected light prevents direct imaging. We discuss how similar planets may contaminate the sample of the very short microlensing events that are interpreted as free-floating planets with an estimated rate of 1.8 per main sequence star. Moreover, the host star has a nearby stellar (or brown dwarf) companion. The projected separation of the planet is only ~3 times smaller than that of the companion star, suggesting significant dynamical interactions. 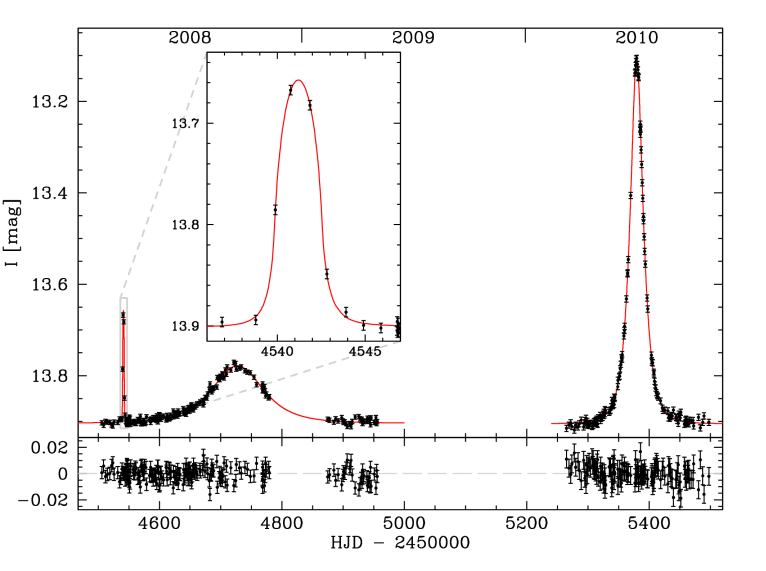 The light curve presents three separate microlensing subevents. Each of them can be fitted by point-lens light curve. The first subevent is the shortest and was caused by the planet. The plot above shows source trajectory (red line) relative to three lens components: planet (1), planet host (2), and secondary star (3). The inset shows tiny planetary caustic (blue diamond-shaped), two source positions corresponding to the two epochs with the highest magnification (green squares), and part of the source edge at the earlier of these two epochs (green arc).